A game-changing love lesson from Chris Rock’s Netflix special, Tamborine. They say that the heart of comedy is truth. And I feel compelled to give 53-year-old Chris Rock — whose first comedy special in 10 years is now streaming on Netflix — some sort of “truth bomb” medal for the relationship revelations I experienced while watching "Tamborine." After 16 years of marriage, and a rough divorce, he’s learned some serious lessons the hard way, and claims he’s finally got the whole relationship thing figured out. I’d never heard relationship dynamics described that way before. Alpha and beta, sure, but those titles don’t leave much room for nuance — or harmony. But a band, with its musicians and instruments that each serve a unique purpose; one that can change and grow from song to song, album to album? Now that’s an extended metaphor I can get behind. I’m single now, but in my past relationships, I’ve really struggled with power dynamics. I tend to be attracted to men who are only capable of singing lead, and then I’m surprised when I find myself bending over backwards to keep up the tune: Agreeing to his schedule when making plans, always being available on text when he wants to chat, providing advice and emotional support through too many one-sided conversations. I certainly didn’t think that Chris Rock would be the person to help me reclaim my self-worth and pursue dating with a renewed desire to find a true partner (or bandmate, as it were) — but here we are. Here are some of the ways that looking at relationships like being a part of a band has changed the way that I date. Not too long ago, I was dating a guy who had started his own business. I found this to be really brave and attractive, and he was equally drawn to my success and stability as a freelance writer. We saw each other as equals: both highly motivated and doing well in our respective careers. A few months into our relationship, I landed a big new client and was able to upgrade my living situation in the city. I think in his mind I was “pulling ahead.” Almost instantly, he began to pull away — canceling plans and complaining of being “sick” for weeks. Looking back it’s clear that he was more fragile than I knew, and couldn’t handle even the potential of playing a bit of tambourine. Even if you’re both technically “breadwinners,” each of you will need support in different ways at different times, which is why this metaphor works so well. One of you might be used to singing lead at the office, and therefore have a hard time adjusting to picking up the tambourine at home. Or perhaps you’re an only child who’s been on lead in your family your entire life, so sharing the spotlight, let alone giving it up, feels completely unnatural. I asked Emily Holmes Hahn, a professional matchmaker and the founder of LastFirst, how someone like me — an independent and self-sufficient woman who wants to date an equally strong guy — can manage this balance. She notes that along with household and career roles, the lead and tambourine can also be a metaphor for alpha and beta personalities. She says it’s critical for couples to be on the same page about the dynamic they’re looking for in a long-term relationship. “If one person prefers to be ‘in control,' then they need to let that be known early on and be sure they’re pursuing a complementary partner,” she says. “Play it right! Play it like Tina Turner!” Watching Chris Rock do his impression of playing an imaginary tambourine like Tina Turner is indeed hilarious, but he brings up a valid point. He says nobody wants to see a mad tambourine player. Why? Because being resentful or bitter about your role in the band means you can’t achieve a harmony. I kept dating lead-singer-or-nothing guys and getting quietly upset when it would never be my turn for a solo. There was a time in my life where my nickname might as well have been “resentful tambourine girl.” I kept dating these lead-singer-or-nothing guys, and kept getting quietly upset when, after a while, I realized it would never be my turn for a solo, nor would my charming, hip-slapping tambourine playing ever be acknowledged. This pattern is, rather obviously, more my problem than it is the fault of these men — I wasn’t admitting to myself that I wanted to be the lead (and be in control) some of the time. “It can be so hard when one partner is actually working just as hard as the ‘breadwinner,’ but feels their contributions go unnoticed simply because they are less tangible,” she says. You know that part of a concert when the singer goes around and acknowledges every member of the band, giving them a little solo time in front of the crowd? That’s what she’s getting at. The Rolling Stones aren’t The Beatles, and Fleetwood Mac isn’t The Eagles. Even NSYNC and The Backstreet Boys each had their own thing going on. And when you’re in a relationship, it helps to remember that just like a band, no two couples are exactly the same. You’ve probably been in a different band before, and that music sounded different, right? Maybe not better or worse, but definitely different. So pay attention to the elements, big and small, that make your relationship singularly wonderful. After my first serious relationship ended, I thought, “What am I going to do? I’ll never find another guy like him.” And I was right. When my next paramour came along, I was skeptical of our connection. It built up and caught fire slowly, whereas my last relationship had felt undeniable from the moment we first made eye contact. It took me a while to appreciate that in this new relationship, our growing affection for each other was not only okay, but magical in its own way. In a new relationship, this comes more easily, but it’s even more critical as time goes on. By the time you’re on your third or fourth album, the music comes naturally, it feels routine. 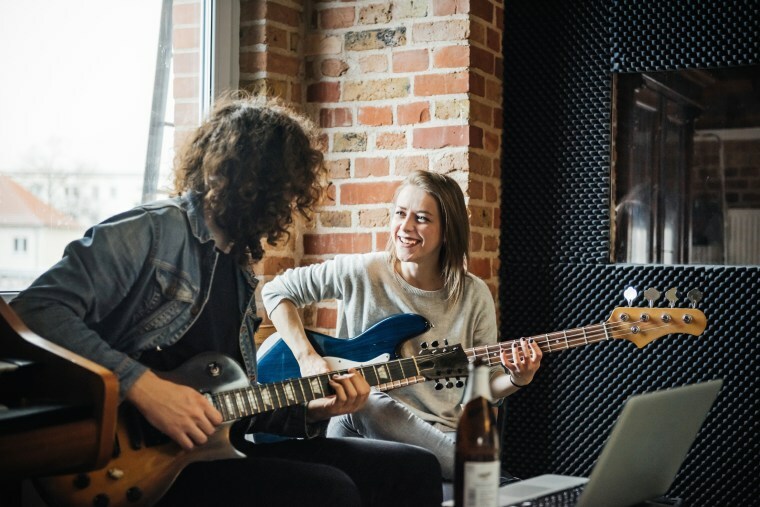 But taking a moment or two to tell your partner why you appreciate them, why you love your band — especially when it’s unexpected — can restore and reinvigorate your sound. The critics will always be out there, in the form of nosey friends, judgmental family members and curious coworkers. They’ll think that they know something you don’t because they’ve been in a bunch of bands that broke up or because their band has been together since the heyday of vinyl. It's important to remember that only you know the feelings you share with your partner, and only you can decide what makes you happy and fulfilled. And as for the fans? They can be confusing, too. Perhaps your mom thinks you guys are great together, but you haven’t been happy for a while. Or maybe all your friends think your guy is a catch because he has a good job, but you don’t feel that spark. Again, only you know your relationship from the inside, and only you can decide if you want to keep playing, or cancel the show. “When you’re both balancing busy schedules and juggling professional commitments, it’s important to prioritize your romance just as you would those other business obligations,” says Holmes Hahn. And she’s right! After that heady honeymoon period, you’ll have to make a bit more effort to make sure your band keeps playing new tunes. Holmes Hahn suggests using a calendar to pencil in non-negotiable date nights or to put an activity on the books that will give you and your partner something to look forward to. Not too long ago I was in a “short distance” relationship between New York and Philadelphia. Traveling between the two cities wore on both of us, so we had to come up with ways to revive the romance during our visits. Our answer? Cocktails. When I arrived at his place in Philly, he’d greet me at the door with an Old Fashioned — and I would do the same for him in New York. Before we’d even unpack our bags, we’d sit together and have a drink and catch up in earnest. It became a cherished and intimate tradition that helped us both remember why those long bus rides were totally worth it. So whether it’s establishing a romantic tradition that refocuses your attention on each other or new experiences that inspire deeper levels of trust and intimacy (and hey, why not both? ), your efforts may just be rewarded with an astounding collection of greatest hits.